David Hill wins the August Sidney for “In the Pit With the Fighting Roosters,” the story of how a massive raid on a long-running cockfight upended Arkansas’s only majority-Latino city and raised urgent questions about Immigration and Customs Enforcement (ICE) and immigration, published by The Ringer. De Queen, Arkansas is more than 600 miles from the southern border, but its population is roughly 60 percent Latino. When authorities including the Department of Homeland Security raided a cockfight in March, many locals alleged that the raid was racially motivated. De Queen’s immigrants started arriving in the 80s and 90s when Tyson Foods engaged in human trafficking to staff its chicken processing plants while squelching local union drives. Over the years, they built homes and businesses, raised families and sent their kids to local schools. Now De Queen’s residents live in fear of deportation. The Trump administration has increased immigration raids by 171 percent. The Obama administration largely left law-abiding immigrants alone, preferring to deport serious criminals, but the Trump administration changed course and started targeting all undocumented people for removal. “It is ironic that backyard cockfighters are being targeted with helicopters while Tyson Foods tortures chickens with impunity,” said Hillman judge Lindsay Beyerstein. Hill was struck by the bravery of De Queen’s undocumented residents who, at great personal risk, banded together to push their town not to cooperate with ICE. “I think the message of this story is that anyone, even the most vulnerable among us, can have real power if they organize together and speak with one voice,” Hill said in his Backstory interview. David Hill is currently writing The Vapors: A Casino in Southern Gothic for Farrar, Straus & Giroux. He is a Vice President of the National Writers Union, UAW Local 1981. Q: What started off as a story about raid on a cockfighting ring became a much wider story. Can you recap some of the twists and turns that your investigation took? A: I first heard about this story on the local news while I was in Arkansas doing some research for a book I’m writing. It was a big story because of the size of the operation and the scale of the raid. 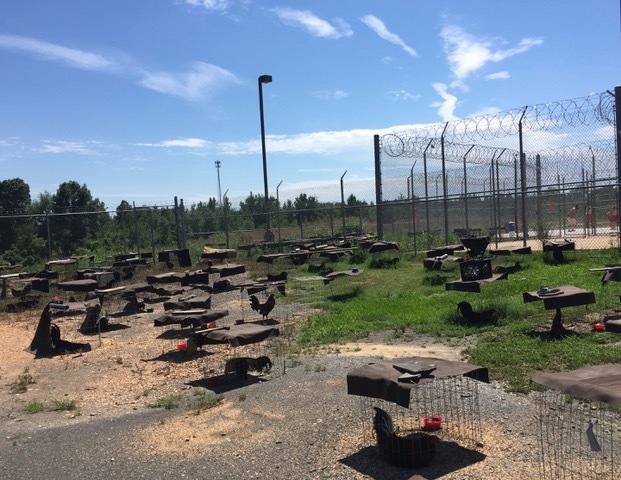 The media attention mainly focused on the fact that the county chose to keep the birds instead of killing them, and now had hundreds of roosters and didn’t know what to do with them. So when I pitched the story, I thought it would be a much lighter piece. When I started digging in and contacting people in the community, I learned that an immigrants rights group in Northwest Arkansas called Arkansas United Communities Coalition was involved and working with arrestees. When I contacted AUCC, I learned that there was much more to this story than just cockfighting, and that what was going on in De Queen was very serious. As I talked to more people, I realized that the story I needed to tell was about this community and how the Trump administration’s policies were threatening to tear it apart. I contacted my editor and let him know where I thought the story was going and he said to go for it. Q: How did Tyson’s union-busting tactics make DeQueen the town it is today? A: Tyson was facing a serious unionization threat in the late 80s and early 90s that was a direct consequence of the work in the poultry plants changing to become more like assembly line style factory work. As work sped up to increase production, the plants became more dangerous and injuries were on the rise. Tyson was terrified of the workers unionizing so they actively plotted in a number of plants to bring in undocumented immigrants because they thought those workers would be less likely to form unions. They went as far as hiring smugglers to bring in busloads of workers and provide them with forged documents, and paying those smugglers as much as $200 a head for thousands of workers. Then the managers would tell those workers to tell their family members back home that if they came across they’d have jobs in the plants. There were recruitment posters for Tyson in border towns in Mexico. So one wave after another came across with the promise of work in these poultry plants. Tyson eventually got caught for this, some of the managers involved went to jail, one even killed himself. The company, however, was able to blame it all on “bad apples” and escape any real consequences. They tightened up their hiring practices, but in De Queen, which is in the heart of the poultry industry in Arkansas, there were now thousands of immigrants who had been brought there by Tyson who now needed work. They started businesses, they found jobs in surrounding cities, but they had set down roots in De Queen, and many resolved to stay there. Today De Queen is the only majority-latino city in Arkansas. Q: There are so many little gems in this story. Tell us about the con man who makes a cameo appearance selling $250 USB drives to cockfighting enthusiasts. This man named BL Cozad is a prominent cockfighting activist. He was profiled on an episode of Real Sports on HBO. He has made a name for himself advocating for the sport of cockfighting and argues that it is a constitutionally protected right. When news got out about the raid in DeQueen, Cozad traveled to Arkansas to meet with the cockfighters. He sold them all a USB drive that contained documents that he promised them would get their cases dismissed, and he told them about cases in other states where these documents had worked. I found some cases online that had filed his fill-in-the-blanks Motion to Dismiss, but I hadn’t found a single one that actually resulted in a dismissal or didn’t have the judge disregarding the motion itself. But many times the people facing cockfighting chargers are looking for any help they can afford, and giving someone who has been on TV $250 for something he assures you will get your charges dropped feels a lot easier than paying a lawyer a lot more money to be told that you’re probably going to pay a big fine and maybe spend some time in jail. So he essentially is preying on their vulnerability, like everyone else in this story. I think it’s also pretty ironic that Cozad’s Facebook page is full of anti-immigration, pro-Trump stuff. When I told some of the cockfighters who had met him about that, they were shocked. Q: Can you bring us up to date on where DeQueen stands today in terms of cooperation with ICE? A: Things are actually worse. I heard from people down there that not long after the story came out, ICE went to all of the local businesses and delivered packets for them to fill out with information about their employees, essentially looking for anyone who is working under false social security numbers. There is a feeling in DeQueen that deportation raids are coming, and that they will target the restaurants and other local businesses and not just the poultry plants. Q: What do you see as the most important take home message of this story? A: For one thing I was glad to get to write this for The Ringer. They are a sports and pop culture publication, but I think they still do very smart work. I like that people read this story who may not usually follow politics or hadn’t read any of the other stories floating around about ICE. After it came out I did some interviews on like morning sports talk radio shows. I’m sure those shows weren’t going to talk about ICE and immigration otherwise. So I’m grateful that The Ringer let me go in the direction I did with this story, because I think this is a crucial issue right now and that our country is at a real moral crossroads and everyone should be talking about what ICE is doing. I think ultimately this is a hopeful story. I think that undocumented immigrants in De Queen are an incredibly vulnerable group of people who risk deportation and jail every time they leave their house. Yet they are able to fight back against this situation by organizing and working together. In the end I was happy to have the frame of the cockfight, because it provided so many good parallels. Cockfighters defend their sport by saying that these birds are cared for and provided a better life than they otherwise would have had, which is a lot like what people say about immigrants in the United States. They want to justify one form of exploitation by saying it could be worse. And the birds are strong and powerful, even at the end when they are all in cages. I think the message of this story is that anyone, even the most vulnerable among us, can have real power if they organize together and speak with one voice.